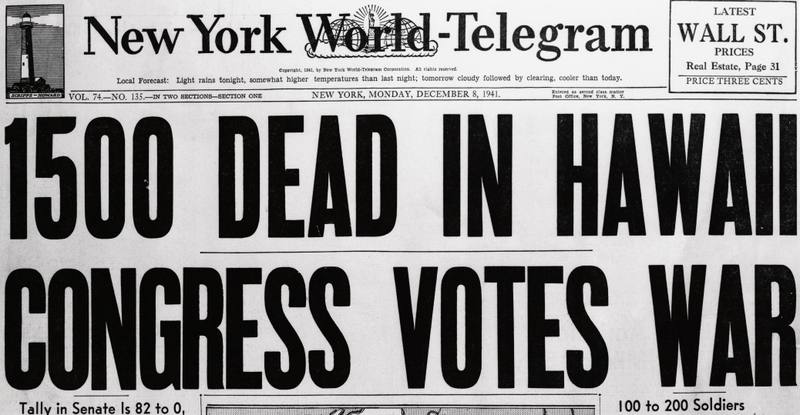 On December 7, 1941, Pearl Harbor was attacked. Every year, I see less and less about this horrible event. On September 11, 2001, Americans were viciously attacked once again. But every year, I see less and less in the news about this horrible event. While we like to think these attacks were different, they are not. The attack last week in San Bernardino, CA is no different either. Nor the attack in Paris. Nor the attack in....you see my point. While we are all trying to live "life as usual", we cannot hide the fact that we are at war...in other countries and now, once again, it is being brought to US soil. Just a reminder that 74 years later we are still at war! I think so too Brenda…sad…. At least, a few of us, realize this. I always remember and it saddens me that people forget...so many men died...just like now. I don't think you get carried away...I think it is wonderful that you speak out. More of us need to follow your example!! Sadly, today, our enemy could very well possibly be our next door neighbor! At least back then, we knew who the enemy was! Love and hugs to you Tessa!! So few men and women left from that era now. It's sad, but if we don't remember, it will be forgotten. My dad fought in WWII. He was a tail gunner. Enlisted at 17...lied about his age to join. He was a true patriot. Thanks for the reminder. So proud of your dad and you are right, a true patriot! I think it is always so important to remember these wars...WWII changed so many things in the US. Today is definitely a pensive day. My dad fought in WWII and was seriously wounded, while my mom stayed at home with my 3 oldest sisters, worrying the entire time, a time when lack of communication was just as maddening as the overabundance of it is today. Imagine how sombering America's Christmas was in 1941....we are so, so blessed - in spite of those who hate our culture. Thanks for keeping the awareness of this history, and your ring of friendship, Benita. Wow, I know that truly had to be horrible for your mother. I just cannot imagine back then, when mail took forever to get from one place to the other, especially overseas…and phones were still not abundant in a lot of places. So glad he came home!! I do know that Christmas was such a horrible time for everyone and yes, we are so blessed. It sickens me that so many hate our culture so much that they want to kill us for it. That is something I cannot fathom, at all. And thank you so much for your friendship also…I have been so blessed by every single one of you! Thank you for posting this reminder. Our nation is deliberately forgetting where we came from and how as Americans we fought for our freedoms and pride. Just like Rita's Father, my Father fought as well in WWII, leaving behind my Mother and two year old sister. I am proud to be an American and I will never forget nor will my family! I think we all need a little reminder every once in a while so that we can focus on where we’ve been and where we need to be heading. I’m glad you father made it home also….it was a horrible time! Much love and hugs to you sweet Jemma! My father was a POW in WWII. He sadly passed away three years ago. He never wanted to talk about things that happened. He was a good man. He was my hero. Thank you for remembering these great men. Let's all pray for all the men and women now who so bravely trying to keep us safe. It breaks my heart how this world has changed.